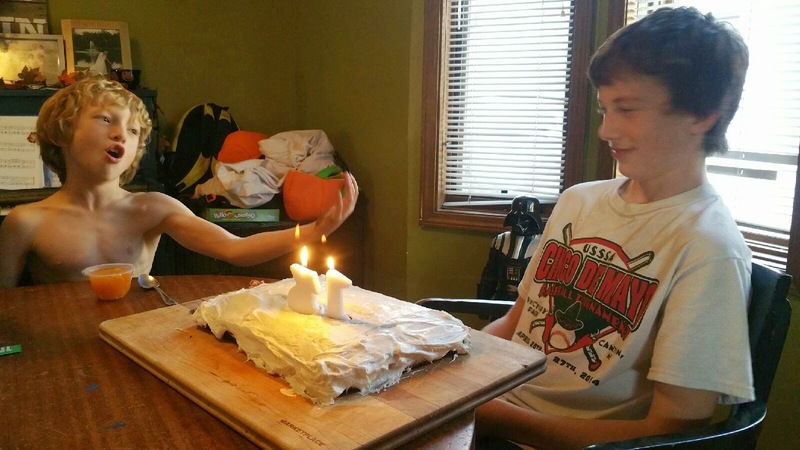 My oldest son, Peyton, turned 13 yesterday. Thirteen? What? How can that be? My first born, my first baby, is now a teenager. It feels huge. 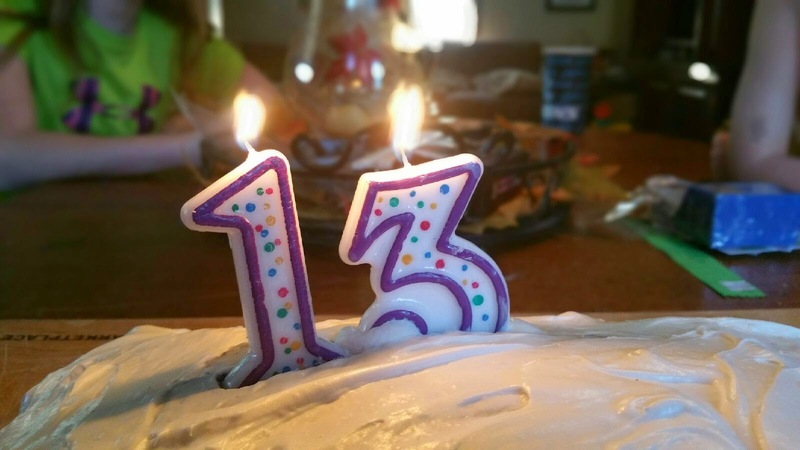 In the last couple weeks leading up to the big day, I was researching ways I could honor the huge-ness of turning 13, of becoming a teenager. I felt like we needed to DO something. We aren't Jewish, but I love the idea and the traditions involved in a Bar Mitzvah. I love the idea of celebrating and honoring this milestone. I came up with a few ideas that involved chanting, torches and possibly sleeping out in the woods overnight. But none of those ideas seemed like something we could totally get into. I wanted to honor Peyton, not embarrass him or make him feel uncomfortable. This past week was busy with Halloween prepping, class parties, grocery shopping and list making and job hunting and helping kids with coughs and colds get better. My ceremony research got lost in the shuffle of life. Then, we got the incredibly sad news that our friend had died from complications of Leukemia. The funeral was this past Saturday. It was packed with people, young and old, there to honor the life of this man, a father of two, and to support his wife and their kids. The pastor asked people to come up and share their memories and stories. One friend after another got up and told stories about what they remember, what they love and what they will miss. They told jokes (a few that made the more conservative folks in the church blush), they laughed and cried. They were real and raw and inspiring and full of so much love. It lasted for almost two hours and nobody wanted it to end. It was beautiful and meaningful. I got in my minivan to head home and I cried. I cried for the tremendous loss. I cried for the wife that lost her best friend and the kids that lost their dad. I cried for everyone who has suffered the loss of a loved one. I cried because I felt vulnerable and afraid of what I could lose. I cried because I felt grateful for my husband and my kids and my life. That night was busy with breaking up wrestling matches between brothers, cleaning up the house, taking care of a husband who was a little under the weather, remembering to set the clocks back an hour and trying (but failing) to stay up to watch Prince on Saturday Night Live. My grief got lost in that whole shuffle of life. I woke up yesterday morning, heard the kids talking in the living room and realized I was the mother of three kids and one teenager. Peyton was 13. I also woke up knowing what kind of ceremony we would have to celebrate and honor the huge-ness of it all. It would be a ceremony inspired by the stories I had heard the day before. At breakfast I told the kids to think of at least one story about Peyton to share when we had birthday cake later in the afternoon. A funny story, a good memory, whatever they wanted to share about Peyton. We gathered around the table later that day with cake and candles. We sang and then we shared our stories. Lucy talked about how they used to make forts on the couch together and jump into the piles of cushions singing "I believe I can fly!" 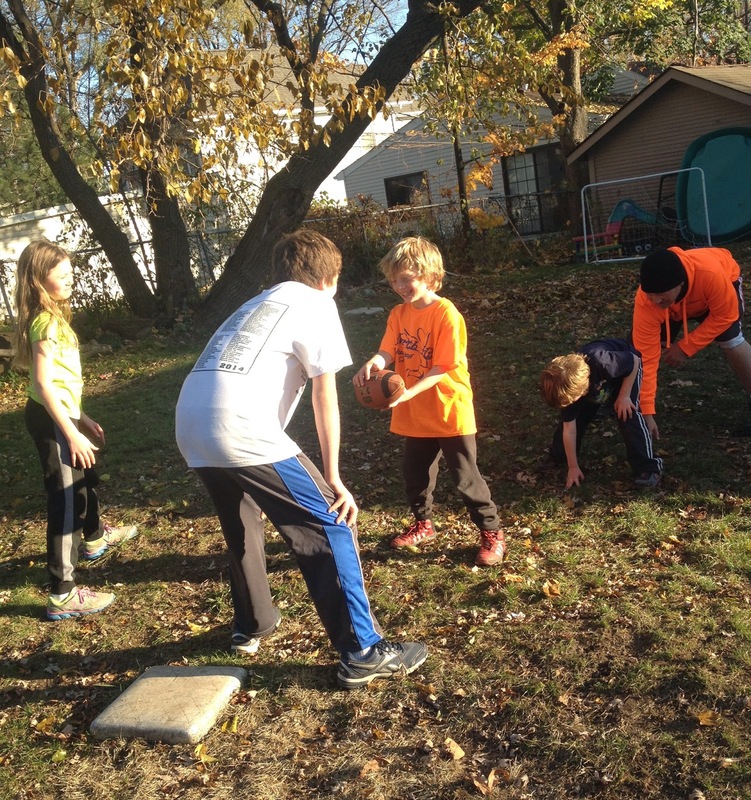 JT talked about playing football in the backyard. Tim and I talked about the day he was born and how we were so unprepared to take him home from the hospital. We talked and laughed and hopefully helped Peyton understand how much we all love him. Hopefully through our stories he understands how important he is to each of us. Stories connect us, help give us history and an identity and purpose and strength. Stories help us tell people we love them and tell the world how much and why we love them. Stories are what we cling to when we want to hold onto a memory or a moment. Stories are a bridge to our past and to our future. Telling stories is the perfect ceremony for celebrating and honoring our grief, our joy, our hope, our love and becoming a teenager. We asked Peyton what else he wanted to do on his birthday and his two requests were: a trip to the new baseball card/sports memorabilia shop in town and a family football game. Done and done. It was an amazing afternoon with my first born, my first baby, who is now a teenager. So sorry for your loss. I love this ceremony! You are such a good mom, and I feel inspired by you. Oh my goodness. That last picture....so sweet. I lvoe that you did this. I'm sorry that you had to go through a loss like that to be inspired, but such a simple thing as all sharing stories isn't something I would think to do, but means so much. Happy birthday to your teenager (!!!!!!!). What a great idea, and something in which everyone can participate fully! So sweet! I love this. The storytelling, the sharing of memories, the love. Happy 13th to Peyton, and to YOU, Angela.